I decided when I have my own house and I'm married, I will never buy bread from the store. I will make it from scratch at home! Bread is SO easy to make and really doesn't involve too much active time. I'll bet you usually have all you need to make bread in your pantry already. Why not try this one? I was originally planning on brushing the top with some melted Earth Balance and sprinkling it with quick cooking oats before baking, but...I forgot. Do that if you want to and let me know how it goes. I think it would be a nice touch. Otherwise, this bread is slightly sweet and delicious. It reminds me of honey whole wheat bread, which I would often buy before becoming vegan. So good. It's a heavy bread, but delicious nonetheless. I would like to try making gluten-free bread sometime. Has anyone ever made gluten-free bread? What did you think of it? 1. In a large bowl, combine lemon juice, water, yeast, and evaporated cane juice. Stir to combine. It will look like your yeast is not activating, but do not worry! Your bread will rise just fine! 2. Add the yogurt, oil, salt, carrots, raisins, and spices to the bowl and stir to combine. 3. Add the flours and mix until it comes together to form a dough. 4. Turn dough out onto your counter top and knead until the dough is smooth and no longer sticky. You may need to work in some extra flour here. 5. Place dough in a lightly greased bowl, cover with a damp towel, and allow to rise for 1 hour. 6. 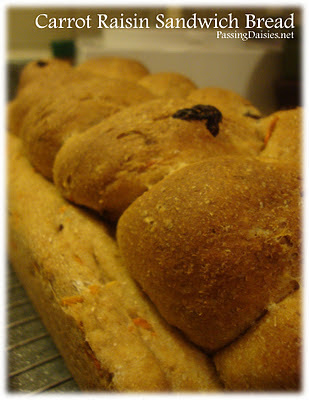 Remove dough from bowl and place it into a greased loaf pan. If you wish, you can reserve 1/3 of the dough and braid it into a topping for the bread. Allow to rise for another hour. 7. Preheat oven to 350 degrees. Bake bread uncovered for 15-20 minutes until the top is golden brown, then cover with aluminum foil and bake for another 30-40 minutes or until the bread is cooked through (internal temperature should be 190 degrees). I'll be honest, my bread cooked for almost an extra hour, but I was worried about it being cooked through. Do what you think you need to do! 8. Remove from oven and allow to cool on a wire rack for 30 minutes before slicing. Enjoy! I'm going to try this and use ww pastry flour to see if it lightens the density of the bread. I'll report back. I think that would work! The original recipe actually called for bread flour instead of the all purpose, so that should definitely work well! I love making bread but I don't do it as often as I'd like. 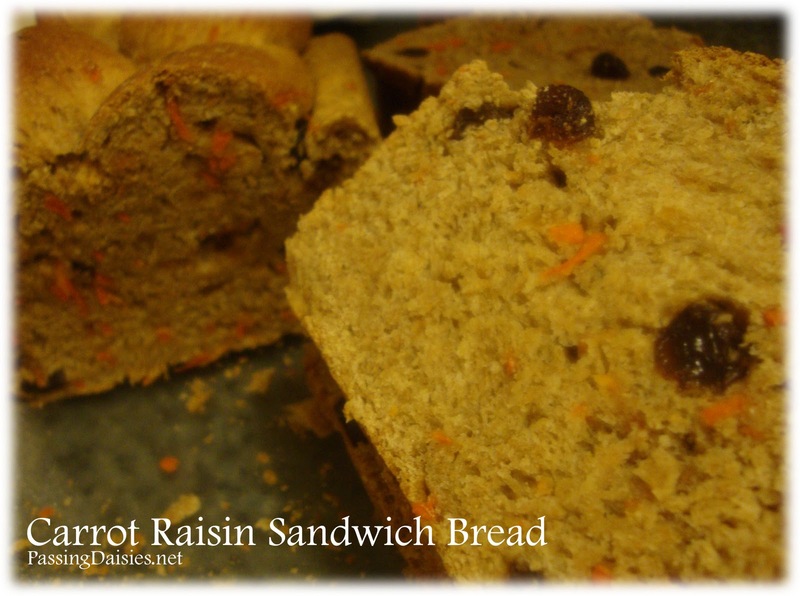 I like the addition of carrots and raisins, I might try to attempt a sourdough version of this.